In Japan, infants' sleep time is one of the shortest in the world. 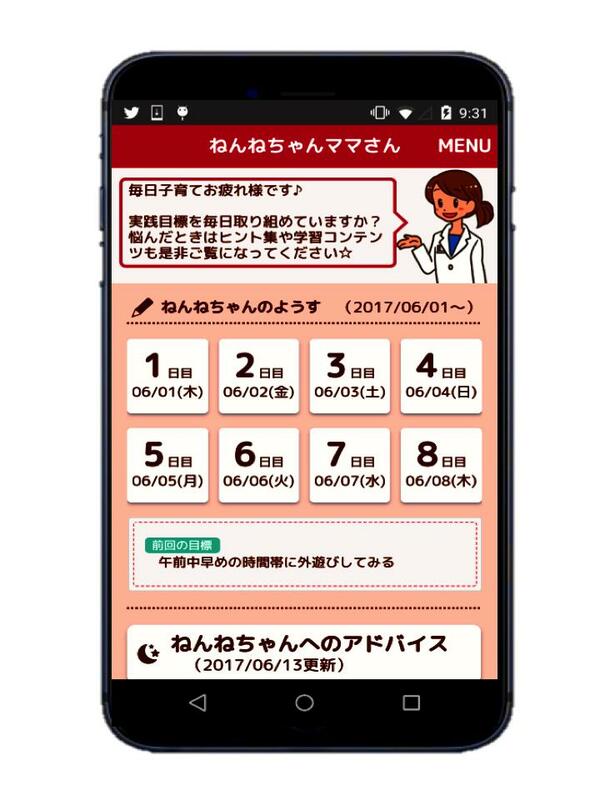 A research group led by Osaka University developed a smart phone application in which caregivers could interactively consult with and receive advice from a group of pediatric sleep experts (pediatricians, a dentist, clinical psychologists, and a clinical developmental psychologist). This research group proved the effectiveness of the application in improving infants' sleep habits through preliminary studies performed at the research institute. In Japan, people tend to sacrifice sleep time to study or work, with sleep times of children from infancy through high school some of the shortest in the world (Mindell et al., Sleep Med, 2010). However, sleep is of utmost importance in childhood development. Sleep deprivation is a risk factor for the development of attention-deficit/hyperactivity disorder (ADHD; Touchette et al., Sleep 2008). Sleep problems are seen in potentially 40~50% of children living in Japan, but these problems are not viewed as serious enough to warrant consultation with an expert and are often ignored. Even if sleep disturbance in children increases their caregiver's fatigue and sleep loss, their access to counseling services is limited in place and time. In addition, people's lifestyles have changed: double income households and nuclear families have become common. Families can't afford to change their lifestyle to allow for a full-time stay-at-home parent to take care of their child(ren). A research group led by Professor Masako TANIIKE (Dean, United Graduate School of Child Development, Osaka University, Kanazawa University, Hamamatsu University School of Medicine, Chiba University and University of Fukui) utilized their clinical experience to develop an application dedicated to sleep problems, called the "NEN-NE Navi," in which parents were able to consult with and receive advice from experts, the first of its kind in the world. (This application can be used on tablet devices as well.) In addition, this group created easy-to-understand sleep literacy education videos for caregiver. It is also possible to connect real sleep data (on actigraphy) to the application as needed. Before promoting the use of this application in local communities, a preliminary test run of the application was conducted to 10 caregiver-infant groups (infants aged 18 months ~ 28 months). There were no problems with the system, and the application was praised for its ease of use. After just one round of consultation to caregivers, improvements in sleep habits were observed in each infant, such as infants themselves voluntarily heading to the bedroom earlier. Children's sleep habits will improve at home through their caregivers' receiving repeated advice from experts step-by-step using their smart device. Making sure children have an early bedtime and get enough sleep will lead to happy, healthy living, reducing parenting stress, which promotes the healthy development of these children. This will suppress the occurrence of hyperactive/impulsive behavior in children, allowing them to grow into adults who can fully demonstrate their innate potential. The use of machine learning will make it possible to perform consultations with and provide advice for multiple caregivers simultaneously, which will make a significant contribution to sleep education and guidance in local communities.